Sonic the Hedgehog is finally coming back and at top speed. Sega is bringing the blue speed-demon back to what he does best. This new teaser for the upcoming Sonic the Hedgehog 4 arcade game shows how the high-octane 2D platformer stays true to its roots. If you’ve been nothing but disappointed with the “next generation” of the Sonic series over the past few years, you aren’t alone. Fans have spoken and Sonic is racing back at top gear to catch up with his loyal followers. The franchise has struggled to catch up with the current consoles which has resulted in clunky, awkward controls for our favorite blue hedgehog. The new Sonic games have tried hard to look great and expand on the classic gameplay, however flashy changes have proven successful. The introduction of new gameplay elements have proven as overkill, changing the franchise altogether. If any ounce of high-speed gameplay is present in the newer games, it’s only there to tease on how great the game series was. Anybody who still owns a Sega Genesis knows how Sonic, Tails, and Knuckles work at their best. It’s not that big of a surprise that Sonic the Hedgehog is getting a makeover, especially one that continues from the originals. After Mega Man 9 came out, it was obvious that some classic platformers just can’t be changed. 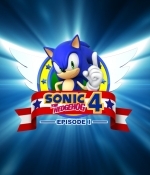 Sonic the Hedgehog 4 Episode 1 takes the same look and feel as it’s predecessors and has high hopes of returning the franchise towards a great gaming experience. Keep an eye out for its release in Summer of 2010 on Xbox Live Arcade, WiiWare, and Playstation Network. Stay tuned as we’ll try to get our copy for a full review later this summer. I couldn’t agree more. Sonic hasn’t had much going for him this past decade and it’ll be nice to see SEGA move him in the right direction with his fans. It has been announced for a release on the iPhone as well.